COMEDI (Various Metal Construction) is a shipbuilding company and metal work created in 2008. 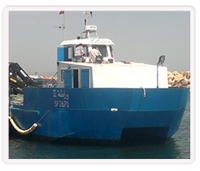 It’s specialized in steel and aluminium vessel construction. The company is located in the town of Sfax which is recognized by its industrial potontiel and maritime traditions. Team of workers of different professions of the sea. Several local and foreign partners. Professional tools and advanced technology for welding. A consulting firm in architecture and marine engineering.